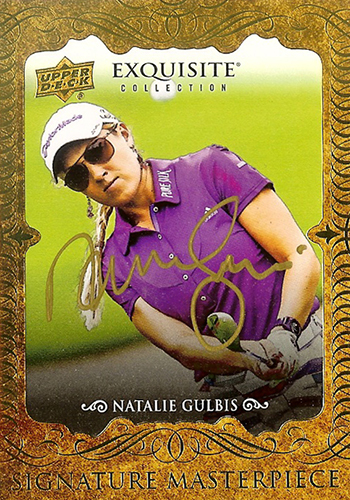 Recently Upper Deck announced the company would be issuing the debut of Exquisite Collection Golf cards for 2014 featuring rookie content of standout stars like Michelle Wie, Cheyenne Woods, Graeme McDowell and exclusive Upper Deck spokesman, Rory McIlroy. Check out some imagery of Natalie’s cards she signed for inclusion in the set. Natalie wasn’t able to convince us to let her keep this card. It will be out in packs for one lucky collector to discover!